First, I would like to thank Disney Hyperion for the chance to read this story pre-publication. My review is based off an uncorrected ARC. This is definitely one of those books that you HAVE to HAVE because of the brilliant cover. The author’s way with words is brilliant as well. I loved the lyrical prose and syntax that threaded this story together. The characters are vibrant and intense; they were complex and saturated with emotional energy. The story revolves around Danny and his best friends, Regina and Harry, who happen to be a couple. Intimate character portraits are painted of all three of them over the course of the novel, and I was invested in each character. But being embedded in the mind of Danny Cheng, the main character, for close to four-hundred pages was exhausting. The story seemed to drag on and on, and I barely made it through to the end. I came really close to DNFing this book. What kept me going was a slight twist in the mystery surrounding Danny’s parents and Danny’s sister. A little over a hundred pages into the book, I thought I had the mystery figured out. But a new clue was revealed that kept me guessing until I decided to go ahead and finish the story. The prose is poetic. The story addresses serious issues such as teen suicide, academic pressure, sexuality, and immigration. I applaud the author for tackling these issues. I think, however, that the book would have been a thousand times better if it had focused intensely on just one of those topics. The pacing was incredibly slow and there were parts of the story where I had to stop and figure out where the author was going. Basically, it felt like there were three different books combined into this single novel, and it made for some confusing chapters. Here are my shallow complaints: The cover and title of this novel are bit misleading. The title of the novel is never evoked within the story. When I was finished, I thought why was this the title? 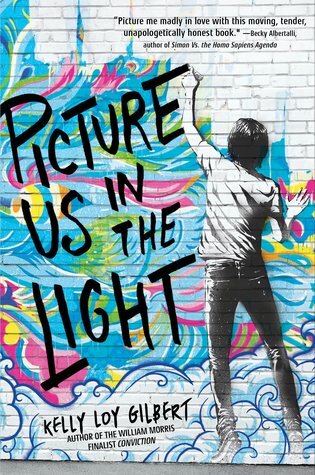 Also, the cover art made me think that the story was going to have something to do with street art or mural painting. IT DOESN’T, and I was really bummed. Overall, I think this is an important story that was beautifully written. The author is immensely talented and I would try reading another one of her novels. But when I contemplate DNFing a book a half a dozen times, I cannot bring myself to give it a rating higher than 3 stars, no matter how beautiful the writing and insightful moments captured on the page are. Is this a book on your TBR list? Have you already read it? I would love to hear your thoughts in the comments section below.